The midterm elections were a pivotal victory for progress in the U.S. Women, people of color and the LGBTQIA+ community gained more Congressional and gubernatorial seats than ever before. This is a huge step in the right direction and more should be done continue the fight to rightfully represent marginalized groups. Last week voters set a historic precedent in voting marginalized people into office, and are blazing the way for more to run for office. The victories of this election reflect a hopeful reality — no matter the race, gender, sexuality or privilege, a candidate who fights for underrepresented communities can win. But after we celebrate, we must continue the work. Straight white men still dominate Senate, House and gubernatorial positions so we must increase voter turnout and marginalized representation in our government. Out of the 272 women running for office, 107 were elected. It’s a promising start with inspiring stories. At age 29, Alexandria Ocasio-Cortez became the youngest woman elected to Congress. She defeated her opponents Republican Anthony Pappas and incumbent Joseph Crowley in New York. Ocasio-Cortez grew up in the Bronx. She attended public schools and faced issues with housing, education, immigration and healthcare, later advocating for improvements to these systems. Ocasio-Cortez’s empowering story is proof individuals do not need to come from privileged backgrounds to win races. Of the candidates who ran, 216 are people of color. Deb Haaland won in New Mexico’s 1st Congressional District, becoming one of the first Native American women elected to Congress. Veronica Escobar became the first Latina elected to Congress in Texas. in Congress. Omar is also the first refugee, Somali and hijab-wearing woman elected to Congress. Omar advocates for the Boycott, Divest and Sanction (BDS) movement, which strives to end injustice and mistreatment of Palestinians and to urge Israel to abide by international law. No other member of Congress ever supported BDS before. We need more officials of color like Omar who are unafraid to fight for overlooked issues, especially those affecting marginalized communities. Twenty-six candidates who ran for office identify as queer. Colorado elected Jared Polis, who will be the first openly gay man to serve as U.S. governor. Arizona’s newly elected Senator, Kyrsten Sinema, is openly bisexual, joining Tammy Baldwin as the only LGTBQIA+ Senators. In Kansas, Sharice Davids became the first openly LGBTQIA+ member of the Kansas congressional delegation, identifying as lesbian, and became the first Democratic woman to represent her district. Davids is also one of the first Native American Congresswomen along with Deb Haaland who was also elected last week. 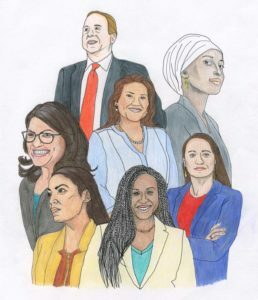 These politicians will bring a wider understanding of issues affecting diverse communities in the U.S. and hopefully change this country for the better. Though voters made significant progress by choosing diverse figures in this election, the majority of elected officials still do not represent their respective communities. The majority of congressional seats are held by white men even though they only make up about 37.6 percent of the U.S. population, according to the 2010 and 2017 Censuses. They still hold the majority of power in our country. The progress made so far should inspire individuals from marginalized backgrounds to be more politically active and support future candidates who will truly represent their communities. Such candidates have a firsthand understanding of the issues marginalized communities face and know what changes need to be made to address them. These lived experiences can carry us further than any white man with an Ivy League politics degree ever could. Beto O’Rourke, candidate for the Senator of Texas, lost by only a 216,936 difference in votes — a small margin compared to the 28.7 million people who reside in Texas. In Georgia, Stacey Abrams knows she could still win and continues to fight for uncounted votes. Abrams needs about 21,000 more votes to prompt a recount or runoff election. If she wins, she would be the first Black female governor in the U.S.
As the largest voting generation, young people must continue turning out to vote in future elections, because our votes do count, especially in tight races between officials of color and white incumbents. The tide is turning in the U.S. People from humble beginnings and marginalized backgrounds are gaining more seats in politics. We should not only applaud these triumphs, but use them as stepping stones for our own progress toward a fully representative government.